So one day a few years back, I was watching the show “The Real World” while lesson planning. I thought about how boring workbook pages are for homework. They just copy someone’s answer during breakfast or before class anyways. Their tag line “find out what happens when people stop being polite and start getting real…” made me think. What if homework was “real?” What would that look like? So then the Real World Homework was created! I went to the coffee shop to meet my friend Rachel C. and the ideas started flowing! 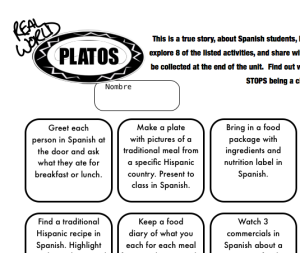 So for the food unit, they can bring in a box with cooking directions in TL (target language), print a recipe in TL, try a TL restaurant, order in TL, bring in a dish, find a TL song with 3 food words, etc. We tried to vary the modes and the multiple intelligences on the tasks. We realized that students were finding the resources that we spent hours finding! Brilliant. Next we added some student choice. We said that they only had to do 5 of the 10 activities. Also we put blank boxes so students can add their own ideas after approval. Talk to your Cuban neighbor about the foods he loves? Sure! 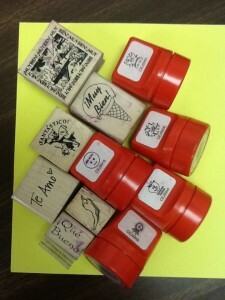 Finally we made a system to organize it and add a dash of fun: stamps. I have all kinds of Spanish ones! The homework is formatted where I stamp it after they show it to me (usually during independent work time). It’s either completed, or not. No “grading” right or wrong! It is due by the end of the unit, or sometimes I’ll say I need a certain one done by a date so I can use them in class the next day. Sneaky, huh? 🙂 It also has helped when a student finishes early in class. Now they have something they can work on independently. I assign it at the beginning of the unit and decide how many they need to complete (usually 5 or so). Since it’s due on the last day of the unit, I like to have a stations day to review and practice right before the summative unit assessment. I set up one station to be me to check their Real Worlds. I love having this time to chat with them about what they found. 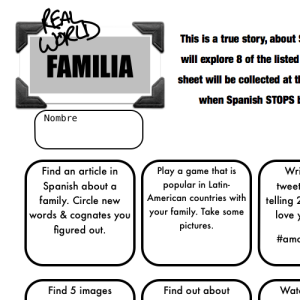 Ivonne R., a former colleague created a “Real World” bulletin board for them to post what they found. Loved that they were showing it off! 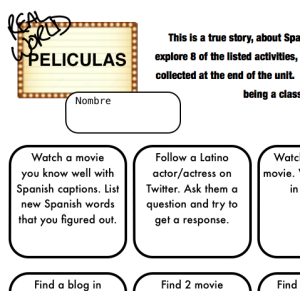 I find that this creates a more authentic homework that students end up enjoying. They spend more time doing this than those workbook pages. This is no way perfect yet. I find that each time I reteach the unit, I add more authentic ones to replace a “forced” one. Below are some Spanish versions for you to download. I am the “Frenchie” friend Rachel and I use these for every level, every unit. You would be amazed at the stuff the students find…they are way more tech savvy than me. 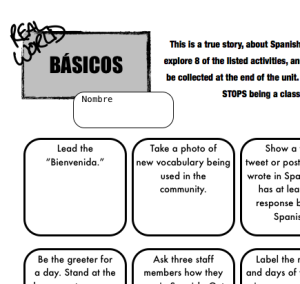 It lets students know that Spanish or French are a part of the “real world”. And with the Internet, there are so many places for them to go and find things. Check out the wikispace for some ideas! I went to the wikispace, but the content for the real world homework session has been deleted. Do you have a link to this somewhere else? Or do you have a compilation book of these on Teachers Pay Teachers? I have no idea why, but it has been deleted. I put up a blank format in Pages. If you download in Word, it may need adjusting. It will take me time to find/load the documents again. Actually, I’m thinking it will be easier to just put this information on this website somewhere. So give me a little time to figure this out! How do you give a grade or points for these? Is it just a matter of giving a certain number of points for each task completed, or do you take into account the difficulty of the task, quality of the product, etc.? For each task, it is all or none for the points. If I don’t think it’s done well enough, I tell them to fix it. I assign 10 pts per square/stamp. If there is one that is more work, I will put it in a double square and count it as two stamps or 20 pts. For each unit I choose how many tasks are reasonable to do. I enter 1 homework grade for the unit. Example: if 5 tasks are required and she only does 4, she will get 40/50 pts. Sometimes I will let them do extras for extra credit. I will only give 5 pts for each extra credit one. This is the only extra credit I like to give. How do you grade or give points for this? Do you simply give points based on the number of tasks completed or do you take into account the difficulty of the task, quality of product, etc.? So glad to hear! It’s so exciting when they want to show off what they can do. New teacher are so brave and ready to try anything! Don’t lose that spirit. Gracias Nicki 🙂 Isn’t is great when students are learning and excited about it?!? Giving students choice is great. In fact, I used choice boards for an entire trimester last year. What I discovered, however, is that the students tended to choose the activities that were on the lower end of the skill pyramid. Then, I began to impose how many of each type of activity students needed to do, so that they wouldn’t select the “gutter ball” activities exclusively. Then it really wasn’t about authentic choice anymore. Then I simply gave it up entirely. My goal is for the students to demonstrate mastery and proficiency. While choice boards, “Real World” – whichever moniker we give them – are fun, what actual skill-building are they generating? Something to think about. True! We have to carefully craft these. I’m trying to make mine based on finding the resource and then something with it that is proficiency level appropriate. I’m definitely still working on that. For one unit, I gave a blank one where I assigned it daily after the lesson. That helped because I had their input plus I defined it. Sometimes it was bring in photos that we could use in class the next day. Overall, I’ve found that they still learned more from the RW than a worksheet that they could copy. Now that I have technology in my classroom, I make resource-finding part of their class assignment. Lots to keep thinking about! Additional thoughts re: Choice Boards: The other situation I encountered with choice boards as homework is that several students would choose the same activity. So, say, for example, five students chose to complete a life-size body portrait. I would have five of those things hanging in my classroom! ::SIGH:: Perhaps I am viewing the situation in a negative light, but, I just haven’t had a good experience with choice board assignments. I still come back to my original question: What do these activities provide in terms of mastery and proficiency? I tried to access the wiki but it said it couldn’t be found. DId the link change? Merci mille fois, planning now for 2nd semester and love all the ideas! Hi ladies! I love your blog. After going to CSCTFL in STL, I’ve realized there is a LOT that I need to restructure in my classroom. 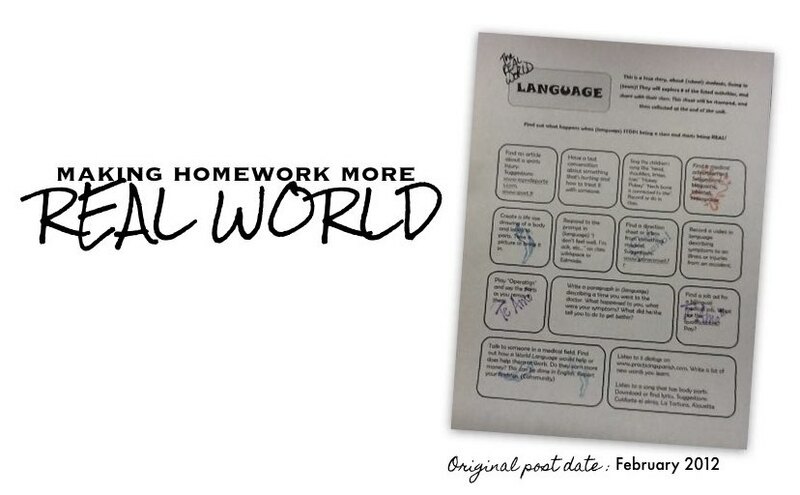 Do you by chance have copies of your REAL World Homework sheets? I tried clicking on the link above but it says the url cannot be found. I’m in the exact same spot. 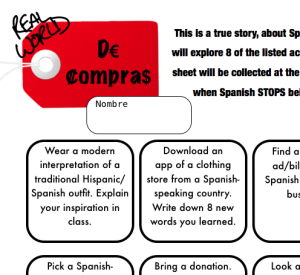 I’ve changed things up so much since the CSCTFL and would love to see some more examples of the real world homework. This is SO much more engaging than silly workbook worksheets! Thank you for this and so many other things on your blog! Kara, do you have an editable document of the stamp sheet that you can share? They are all editable, so you can also make them fit your class. Hi! Your wikispace link is no longer working, and I’d really like to see some more concrete ideas. Thanks! I’ll get it fixed as soon as possible. Thanks for letting us know! Where can I find a template to allow myself to edi the ones you have (as I’m a French teacher). Merci. All of them in our Mercado are editable so you can change and “French-ify” the little details. 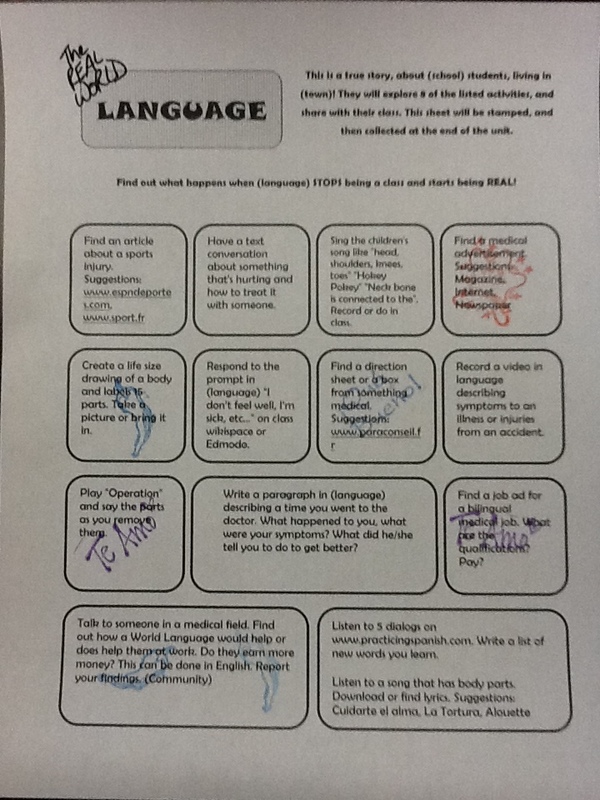 Each one has ideas that can be modified for different languages. You can put a text box over the title picture to write it in French too. http://www.creativelanguageclass.com/product-category/enrichmenthomework/ I’ll put “make a blank template” on my to-do list! I love this idea! I have been looking for more authentic homework assignments that are also fun. I’m wondering what the students do with their real world homework. Do they have to demonstrate comprehension? I am imagining some students just bringing something in that they don’t understand for the sake of getting the points. It sounds like there are in class activities using the homework, but do students do anything beyond bringing them in to earn credit? Merci! Glad you like it Gretchen! It’s an older first post about it and here’s a little about how I’ve improved it over the years. I’ve add some kind of activity to follow up. It might be: interpretive- summarize, pick out new words, categorize words you figured out, What is a question you have after seeing/hearing that? OR presentational/interpersonal- respond to the tweet, give your opinion, make a suggestion, what would you do? OR reflective- (usually for the experience ones) What did you need to know that you didn’t? How did you feel? What are you curious about now? 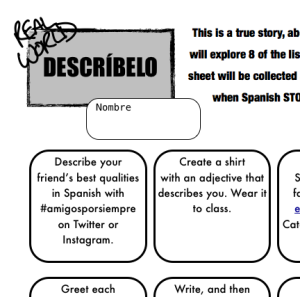 I’ve also done this… tonight I would like everyone to find and bring in an article about (insert topic) in Spanish. We will use it in class. If you bring one, you get HW credit. If you don’t, then I’ll give you one you can use (and it will not be as exciting as the one you could find!). I have found that researching and finding these things do give them a valuable skill where I used to do all that for them. I always learned something new when researching and they are using the TL when doing that research. Look up 5 articles for “deportistas” and that word will get stuck in your head, so I’m glad they are doing that. Sara-Elizabeth presented about homework and I loved how she adds that if she has something they should do in English (like read a deep article or watch a video that gives background knowledge that is above their TL proficiency level), then she sends that as homework and they have to bring in some questions in TL for the next class. Last note, some were figuring out that one person could find an authres and share it with the class. 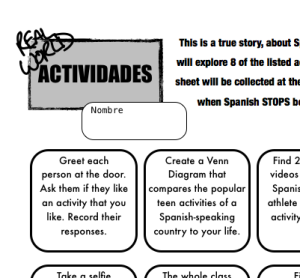 So then I added a new twist like this: find the authres from your assigned country (each student got one at the beginning of year) or each person has a different event. Overall I just want homework to be for a real purpose and keep the learning going. I also wanted some student choice and voice. I would love to know if you have any tips or tricks to improve it! This is such a great idea! I bought your Teachers Pay Teachers example. Do you happen to have any more ideas for the food unit besides the ones listed above?? Thanks! So fun! !